10. 2013 NCAA Women’s Basketball Tournament: After experiencing the men’s tourney the year prior, I got the opportunity to attend the Women’s NCAA Tournament when the Lady Griz qualified for the Big Dance in 2013. Serving as the Pep Band/Spirit Squad contact while also covering all facets of the trip for our social media audience I enjoyed my time in Spokane at Gonzaga University. Although the Lady Griz ended up falling to powerhouse Georgia they put up a great fight and I got to watch all the action from under the basket. 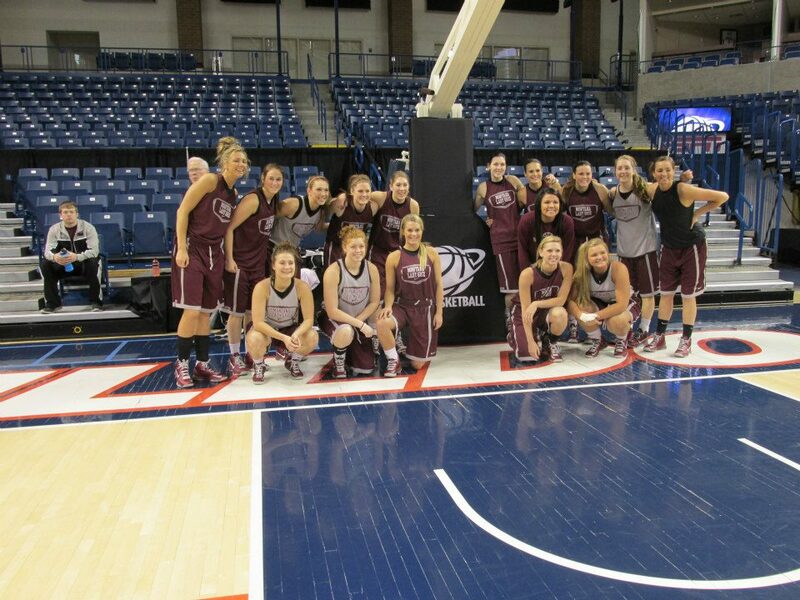 I snapped this photo of the team at the practice session at Gonzaga the day before the game. 9. NACMA Retreat: During the summer of 2012 the University of Montana had the distinction of hosting the National Association of Collegiate Marketing Administrators Board of Directors retreat. Former Marketing Director Christie Anderson worked her way up to a prestigious spot on the NACMA Board of Directors and spearheaded a successful campaign for the hosting opportunity. She let me come along to beautiful Whitefish, Montana, where the retreat was held and help out with the three day event. I had the opportunity to network with the best intercollegiate athletic marketers in the country. Listening to their ideas and challenges provided me with a wonderful learning and development opportunity. 8. 2013 Home Opener Against Appalachian State: In what would be my last football season for the Griz, our home opener was truly memorable. After much buildup to a brand new fan experience in Washington-Grizzly Stadium our advertising did not disappoint as the game went perfectly. All of our planning, brainstorming, and hard work paid off as everything from the sky divers to the Monte entrance to the fireworks to all the intricacies of our protocol went off without a hitch. And oh yeah, on a gorgeous night under the lights our football team steamrolled Appalachian State, 30-6. My brother and dad got to come over for this great game. After the game I went on the field with them to get a picture. 7. 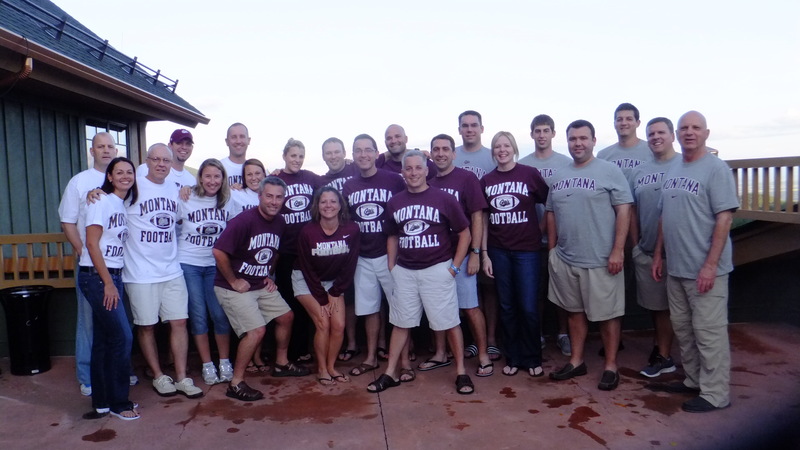 The Roots of “United”: After our athletic director and head football coach were let go completely out of the blue in March of 2012 the Missoula community was in crisis mode as people reacted to the news in a variety of different ways. As the dialogue started to get very volatile and as the national media started to converge the young men on the Griz football team gave all of us a true example of what class and restraint is all about. The team provided us with a letter that we posted on www.gogriz.com that gave a nod to their former leaders, took responsibility for the allegations, promised to hold themselves to higher standards, and asked the community to stick with them. At the conclusion of the letter it stated that with or without that community support they would come back stronger than ever. They certainly did. 6. Montana Grizzlies Facebook Page Reaches 100K Likes: In a major milestone for the Griz Social Media program, our department’s official Facebook page went over 100,000 likes in early March of 2014. In a league completely above anyone else in the Big Sky Conference and the FCS, this mark validated the emphasis our department had placed on social media and provided just another example of why Griz Nation has some of the best fans in the country. 5. A Memorable 2013-14 Lady Griz Basketball Season: Although the 2013-14 Montana women’s basketball team did not advance to the NCAA Tournament I will still remember it very fondly for a couple reasons. 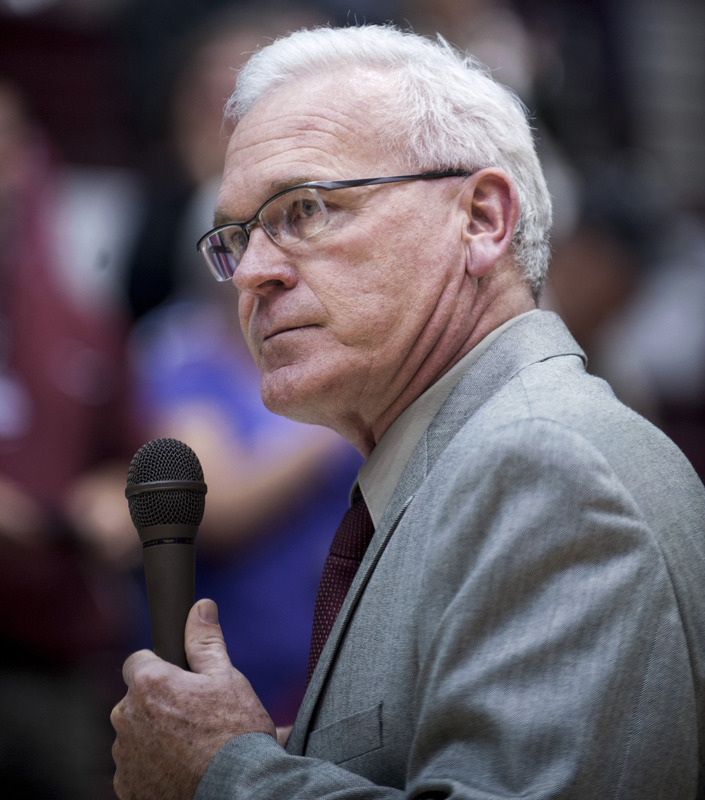 First there was Robin Selvig’s 800th win. The celebration that ensued with him and his team followed by Coach Selvig’s humorous and touching speech will forever stay with me. Secondly, the two games we got to host for the WNIT were so much fun. The team played their hearts out and our fan base truly showed up to support them as much as possible. Although I really wish the Lady Griz would have picked up the win against San Diego I will just remember the noise level in the arena and the feeling inside of me that our players and fans truly valued the post season opportunity they were given. I hope somewhere this speech is recorded (photo courtesy of the great Todd Goodrich). 4. 2009 Appalachian State Snow Game Semi-Final: This game goes down as the most memorable game ever inside of Washington-Grizzly Stadium. Besides the national television audience, the snow, the lights, and the big time victory to advance to the national championship it was also a breakout game for me as the stadium DJ. As a brand new employee for Grizzly Athletics tasked with the big job of running music at the football games, I was always nervous come game time. However, after that game my nerves seemed to permanently go away. Mostly because of the atmosphere that night everything I sent through the stadium speakers seemed to work. Music traditions were born that evening and it was the only time I ever played music postgame at a football event as fans stayed long after to party on the snowy Washington-Grizzly Stadium turf. 3. Griz Demolish Montana State in Bozeman in 2011: During the football season of 2011, the Griz-Cat game was held in Bobcat Stadium with Montana State boasting an undefeated record in Big Sky Conference play. No one gave Montana a chance. It was supposed to be some type of formality for the Bobcats to win and celebrate with the Brawl of the Wild trophy. Are you kidding me? The Griz used the disrespect to kick the tar out of Montana State from the get-go. Early third quarter the fans inside Bobcat Stadium were literally leaving. When the final horn sounded Montana had sealed the victory 36-10 and at the time secured another Big Sky Conference championship. 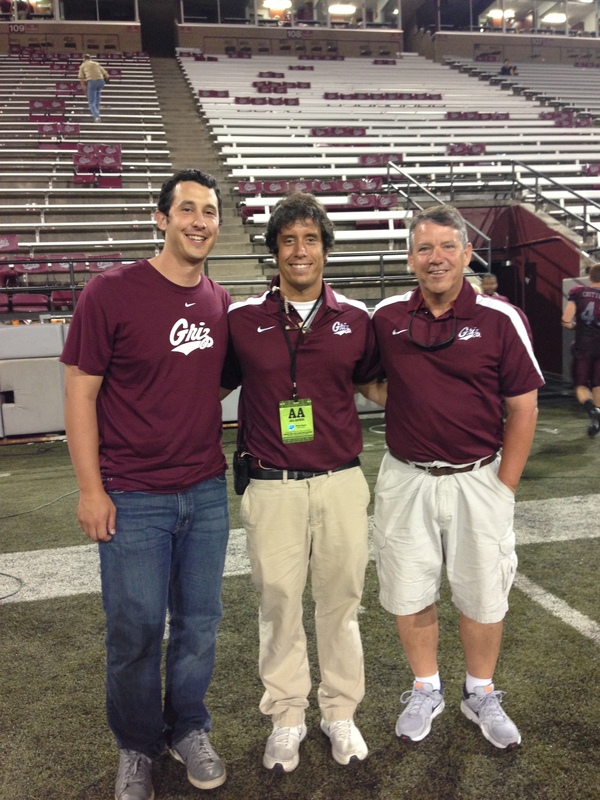 Vacated or not, standing on the sidelines for that game was the sweetest moment I have had as a Griz. 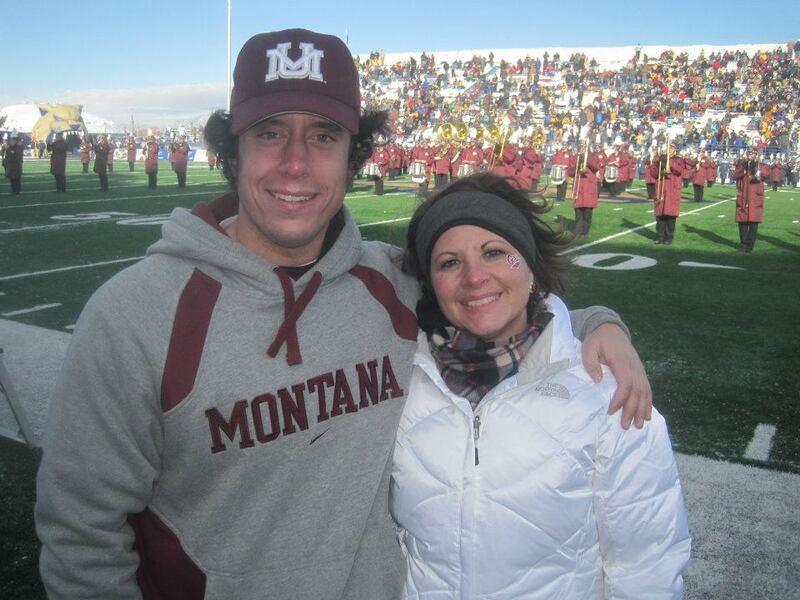 Christie and I during the half at the 2011 Brawl of the Wild Griz-Cat game. 2. 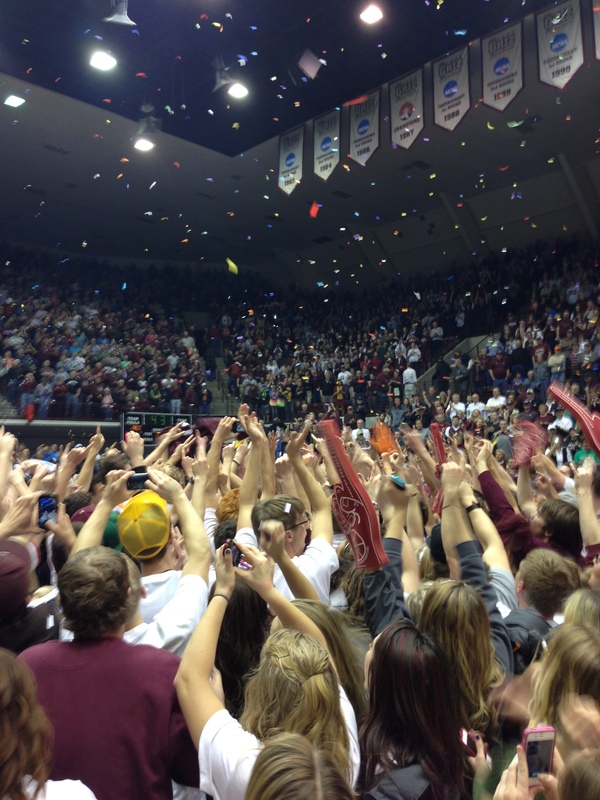 Griz and Lady Griz Go Dancing on Same Day Under Same Roof: Just the buildup in general to March 16, 2013 was an awesome moment all in itself. Grizzly Athletics had the pleasure of hosting both the men’s and women’s basketball Big Sky Conference tournaments last year. As I worked every single one of those tournament games I kept telling myself how lucky I was to have the opportunity to be a part of something like this. To get to the final day and realize that we very well could send both our teams to the premier college basketball tournaments in the nation made me know that an already awesome experience could get even better. Boy, did it. With fireworks going off pregame and confetti falling from the rafters after, the game presentation we put together was almost as good as the play of our teams. The Lady Griz defeated Northern Colorado and the Griz took down Weber State as both Montana basketball programs punched tickets to the Big Dance on the same day on their home floor. Not only had both our basketball teams pulled it off but our staff had pulled it off as well in providing quality tournaments that you don’t see at other conference schools. Along with the 2013 Griz football home opener, I had never been more proud of the experience afforded to fans that day. March 16, 2013 will never be forgotten in the history of Grizzly Athletics. 1. 2012 NCAA Tournament: By far one of the best experiences of my entire life, getting to travel with the Griz basketball team to Albuquerque for the 2012 NCAA Tournament earns the #1 spot on my list for top moments while at Grizzly Athletics. NCAA Tourneys are so special in general but to have the opportunity to be front and center as a participating institution takes it to a whole different level. I had the opportunity to cover the tournament for our social media outlets and gogriz.com. I got to attend the practice with the team. I enjoyed a tour of The Pit. I volunteered my services passing out tickets to the people on the travel party. I watched the game courtside with Christie and our dance team coach. But you know what? Besides the responsibilities strictly related to the tournament I also got to have a lot of fun. I soaked in the refreshing Albuquerque sun, ate the best Mexican food I had ever had, stayed in a super nice hotel, toured the town, and had the best time with my co-workers. What an amazing experience! Monte and I before we went out on the court for the 2012 NCAA Tournament. I am so indebted to Grizzly Athletics for these special moments that I will carry with me forever. I will reflect on them now but in three weeks I will be totally committed to making new top moments and memories at Coastal Carolina University. Can’t wait to start building a new top ten list in the South! Don’t Blink. 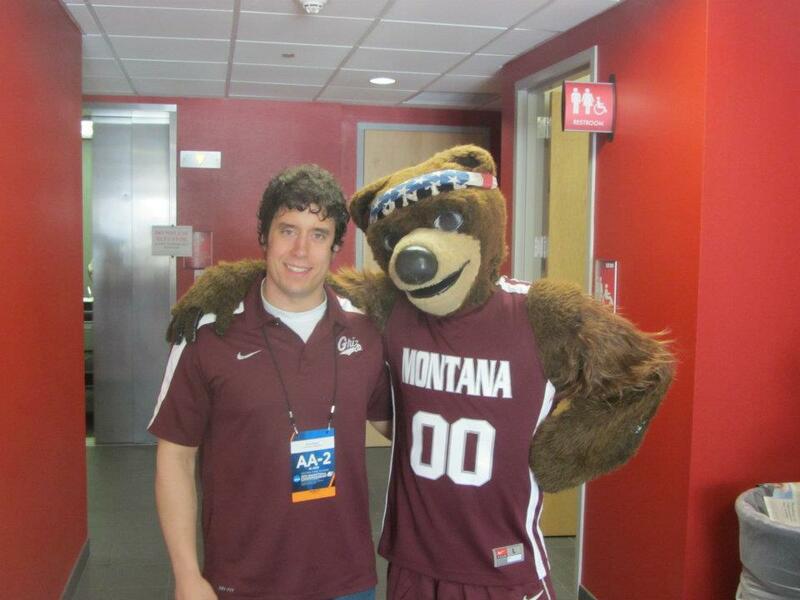 This entry was posted in Uncategorized and tagged Albuquerque NCAA Tournament, Griz-Cat 2011, Grizzly Athletics, Montana vs. Appalachian State, University of Montana, Washington-Grizzly Stadium by brent. Bookmark the permalink.